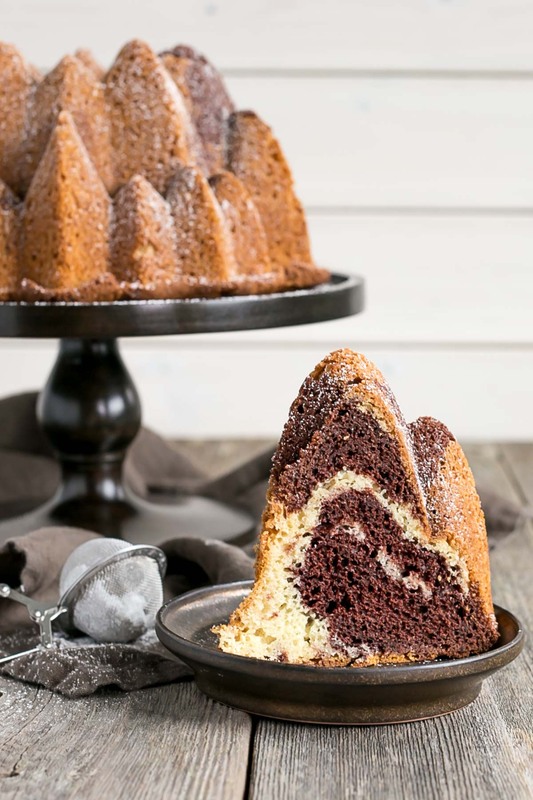 This classic marble bundt cake is the perfect addition to any party or afternoon tea. I can’t believe it’s been well over a year since I baked a Bundt. I am long overdue. I was in a major Bundt phase through most of 2015 and accumulated a small army of beautiful Bundt pans. 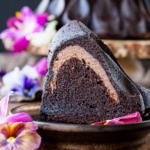 The stunning pan I used for this Marble Bundt is one I actually got for Christmas… in 2015! Crazy, right? 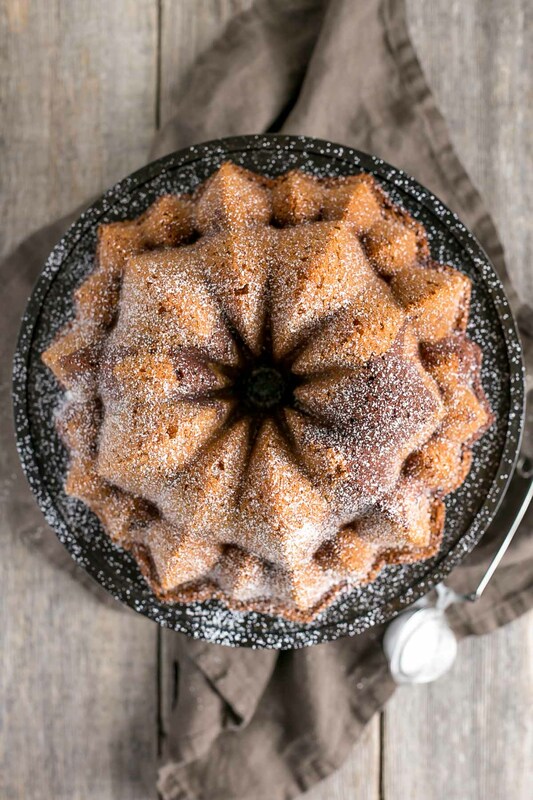 For well over a year this poor Bundt pan was stuck in the pantry unused – but very much loved. My mom had requested a special cake for Easter — namely a traditional Polish Babka. My parents would always buy these in Polish bakeries around the holidays. The ones we bought were never very good. They were so dry you could barely choke them down. I am not even kidding, just ask Ryan! Flavour wise they were ok, but I don’t know if they were specifically shipped in from Poland (on a boat) or what, because they always tasted old and dry. My marble Bundt isn’t exactly the traditional Polish Babka (mine doesn’t use yeast), but my mom said it was perfect. What we’re actually both after though, is to recreate a recipe for this box mix (gasp) loaf cake we used to make back in the 80’s. It was so damn good! My mom says it was Sara Lee, but I don’t quite remember that. All I remember is a red box with a yellow loaf sliced on the front. Does this sound familiar to anyone?? I’ve had a heck of a time trying to find even a graphic online for it. I doubt this was a Canada only thing, but maybe? Am I ringing any bells? When I look up Sara Lee, all I find is the pre-made loaf, and it definitely was not that. It was a vanilla cake mix and my mom would add cocoa powder to part of the batter to marble it. It was pure heaven. I can almost smell it. 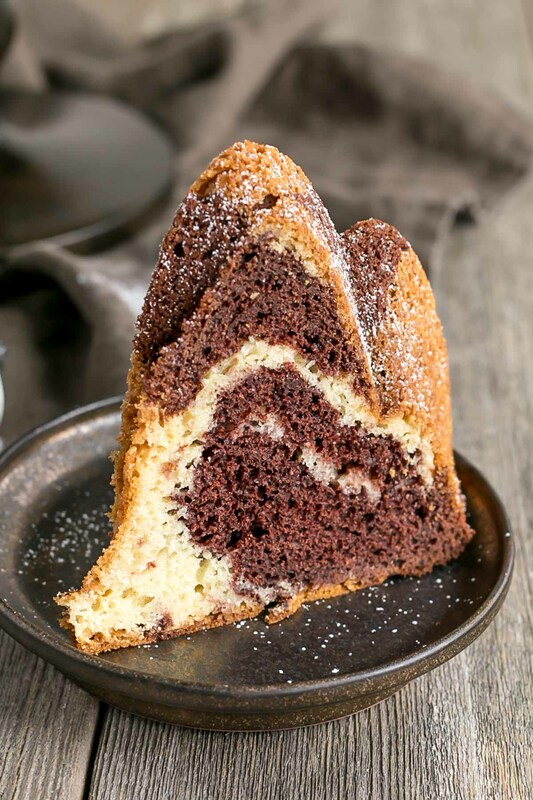 I will continue my search for it, but in the meantime let’s talk about this Marble Bundt Cake! 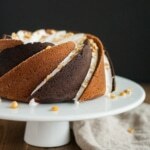 This is a simple and classic cake. 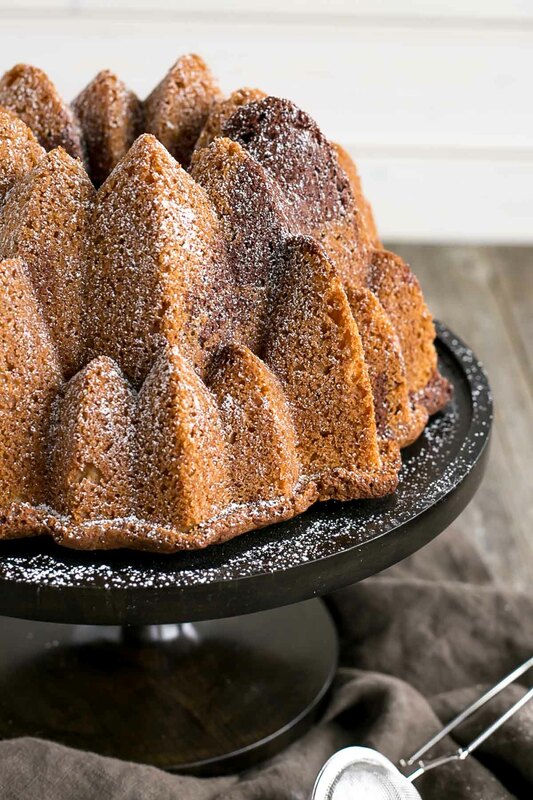 It doesn’t take much to make – all you need is a pretty Bundt pan to make a stunning dessert. 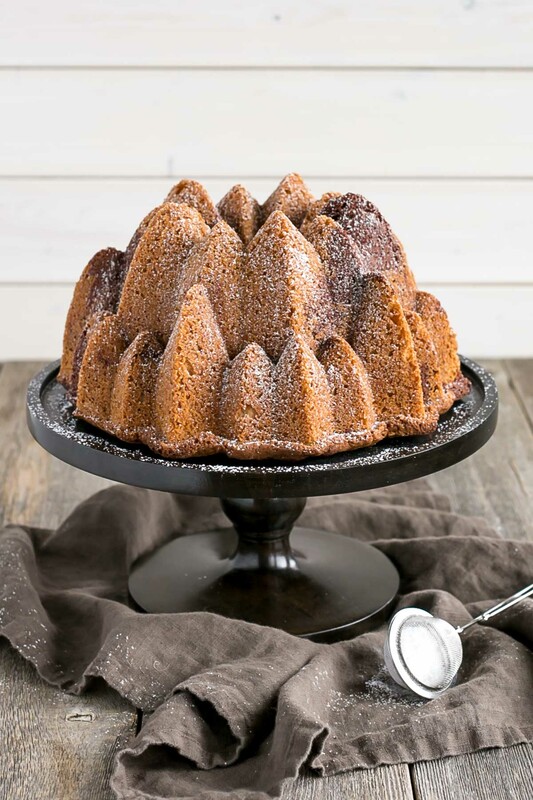 Bundt cakes are typically more dense than typical cakes, so I used cake flour in this one to lighten it up a bit. You can substitute for all-purpose flour though, if that’s all you have. 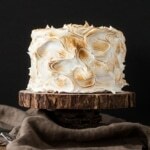 The cake has the perfect mix of chocolate and vanilla, and isn’t overly sweet. 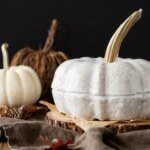 I chose to do a simple sugar dusting, as I wanted to show off this pretty Bundt pan, but a glaze would go really well too. If you don’t have cake flour you can substitute all-purpose. The cake will be a bit more dense, though. If you prefer more chocolate to vanilla, feel free to make more of the chocolate batter. 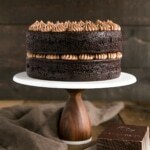 Or leave the chocolate out altogether for a vanilla cake. If you’d prefer a richer chocolate flavour, you can also add more cocoa powder, but be sure to dissolve it with hot water. 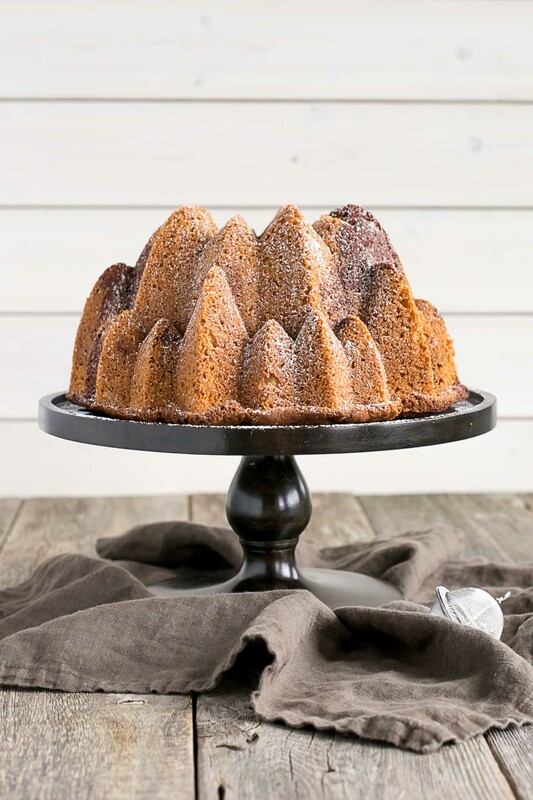 If you’re using an intricate and detailed Bundt pan, I recommend using a wooden skewer to nudge the cake batter into any small cracks, and be sure to grease and flour it well. I use Pam for Baking. The Bundt pan shown here is the Wilton Cascade Bundt Pan. Preheat oven to 350F, grease and flour a 10-12 cup Bundt pan. In a medium bowl, dissolve cocoa powder in 3 Tbsp hot water. Set aside. Alternate adding flour mixture and buttermilk, beginning and ending with flour (3 additions of flour and 2 of buttermilk). Fully incorporating after each addition. Do not overmix. Add 1/4 cup of cake batter to the cocoa mixture to lighten then add an additional 1 3/4 cups to the chocolate batter. Alternate adding chocolate and vanilla batters into the pan, swirling with a cake skewer. Smooth the top with a spatula and whack the pan against the counter to evenly distribute. Bake for approximately 45mins or until a toothpick inserted into the center comes out mostly clean. 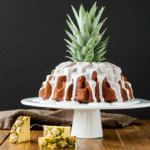 If I spray the bundt pan with Pam for Baking – do I still need to flour it? Hi Benita! Nope, that should be fine – that’s what I use. If I’m not mistaken, this is pretty much a 1-2-3-4 cake (with a little less sugar). It’s delicious and exceptionally light, even with all-purpose flour. Made it with a melted-chocolate drizzle for my son’s birthday, and it was a big success. Hi Chris! Love the addition of chocolate drizzle. Glad everyone liked it! My daughters bday and turned out perfect. Thank you for a very simple yet a delightful receipe. So glad you liked it Jaya! 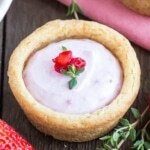 Can this be made in 2 round 9″ cake pans? If so, any recommendation on bake time? 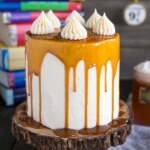 Is it Duncan Hines yellow cake mix you’re looking for? Hi Sue! Hmm, I don’t think so 🙁 I distinctly remember a loaf on the box cover. This is such a gorgeous work of art! I received a beautiful bundt cake pan for Christmas so now I’m completely inspired to create my own work of art. Beautiful! Maybe it was Duncan Hines Pound Cake mix, that is a red box with sliced loaf on the front. I don’t remember Sara Lee being anything but frozen. Do we have to use dutch processed cocoa? Will regular cocoa work? Hi GiGi! You can use regular cocoa powder. 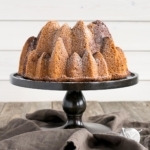 I love marble cake and it looks even better in this fun bundt pan!